Though the weather may indicate otherwise, we’re thick in the middle of fall. Fall: that mystical time of year famous for pumpkin-spiced food, horror flicks, and MMO content patches and expansions. For this issue of MMO Co-Opportunities, we’ll be looking at content expansions that either just launched on their corresponding live servers or Public Test servers. Ravenloft has always been a fan-favorite for Dungeons & Dragons fans, so it’s no surprise that an expansion would be created for the setting. Some aspects of the new Mists of Ravenloft are now live on Dungeons and Dragons Online Public Test Realm. Though the new campaign and areas accompanying the expansion are not currently available for preview as of the time of writing, the PTR gives testers the opportunity to explore the expansion’s new race, new Universal Enhancement Tree, and overhauled Reincarnation system. The new Aasimar race (which will be free to VIPs, unlocked through all Ravenloft Expansion bundles, and available for individual purchase in the in-game store at a later date) get 1 to Charisma, 1 to Wisdom, and the special Racial Ability “Lay on Hands” amongst other things. As with all other races, they come with a fully fleshed-out Racial Enhancement Tree with four Tiers. The new Universal Enhancement Tree is the Vistani Knife Fighter who receives bonuses to daggers and throwing daggers. This Universal Enhancement will be unlocked in select Ravenloft Expansion bundles or earned via Favor in Ravenloft-specific content or available for purchase in the in-game store at a later date. The date of the full release for expansion doesn’t seem to have been announced yet, but it seems extremely likely that it will be released sometime this fall. 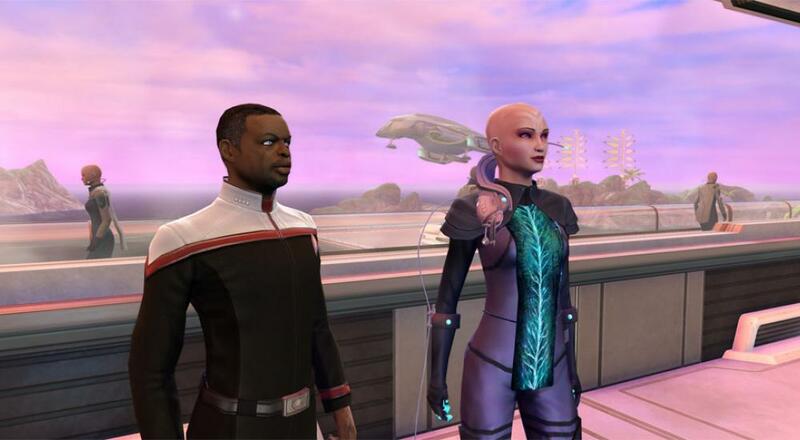 STO players can now participate in Season 14 on the PC servers of the game. This content expansion introduces a new episode (entitled “Melting Pot”) which features the new Lukari-Kentari home planet. As a nod to TNG fans, this episode will have player characters interacting with Geordi La Forge, voiced by the one and only LeVar Burton. Emergence also introduces a new Primary Specialization and Bridge Officer Class (the Miracle Worker). This player and bridge officer profession emphasizes weapon enhancement and healing through engineering. Season 14 will be coming soon to consoles. Rounding out these three content expansions, RIFT also released a new expansion on its PTR. Crucia’s Claw introduces a new Tier 2 raid (Bastion of Steel) and a brand new Mage Soul (the Mystic Archer). Bastion of Steel is an arena-style raid where the players will be pitted against Crucia’s minions. The Mystic Archer unsurprisingly fires magical arrows and sounds like it will require a fair amount of precision-aiming. This content expansion continues along the line started by the massive Celestial Storm (4.2) expansion which focuses on the war between Crucia and Ankhet. Crucia’s Claw will receive its full release on October 25th. Are you playing any of these content expansions, or are there any upcoming content expansions for other MMOs that you’re eagerly anticipating? As always, let us know in the comments below. Page created in 0.7003 seconds.